Zip Line and Canopy Tour Adventures! For the adventure seeking tree house dwellers, zip line rides are the thrill you've been looking for. We install everything from a basic home zip line kit to full fledged canopy tour adventures where people can zip from platform to platform in the trees. Our zip lines have ranged from a 60 foot exit from a tree house to a 900 foot ride that crosses a lake. Some zip lines land on the ground in the middle, and some land on distant platforms in the trees. As you can imagine, a basic home zipline is a much more reasonable choice for children to use with minimal supervision. Tree Top Builders always recommends the use of helmets, harnesses and adult supervision when zip lining. But we know, in reality, this isn't always going to happen because it is up to each property owner to enforce. So for most back yard zipline projects, it's usually smart to keep the ride to reasonable speeds, at reasonable heights above the ground at the start and finish, and to make it as easy as possible for zipline riders to hold on by using appropriate zip line accessories such as handles and seats. Most basic zip lines are about 60-150 feet long and have weight ratings up to 250 pounds. These zipline rides typically cost $2,000 to $8,000 once you add a launch platform, but can be higher if we have significant travel to your location. Another big variable in the price is the kind of launching platform needed - sometimes you can start the zipline ride from the ground, and other times a platform must be built in the trees with a ladder attached. For more serious zip lining, we can install a zip line that moves at faster speeds, are higher above the ground, and/or are in the range of 200-500 feet long. Extra precautions are taken to ensure safety, and harnesses and helmets are strongly recommended. We will teach you about every piece of equipment and how to safely ride and facilitate your guests on your zipline. Along with a zip line comes a level of responsibility: to either inspect and maintain the zipline yourself, or to hire us or another reputable zip line company to inspect and maintain the project on a regular basis. They are a lot of fun, but can also be dangerous and therefore deserve respect. If Level 2 isn't enough for you, then we need to make sure that you have tall & strong trees, the right environment and topography, and the right budget for this type of project. The most serious zip lines are primarily the domain of commercial operations such as adventure parks and eco canopy tours. Canopy tours were originally designed for scientists to survey the tree canopies. But the popularity of taking zipline rides through the tree tops from tree house to tree house has put the canopy tour or zipline adventure course on the map as an attraction to experience. 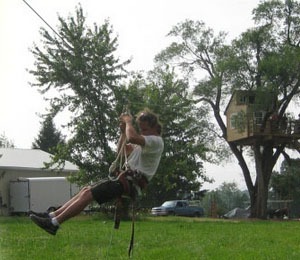 Each zipline leg must be carefully designed and executed in order for participants to make it all the way from platform to platform, but not arrive so quickly that they slam into the tree at the other end. Most canopy tours are designed and built for commercial operations that staff guides who are trained for safe operation. We have, however, also installed them for individual residential clients. A canopy tour can cost $35,000 to $750,000, depending on how ambitious the project is, the number of tree platforms and zip lines, and other site specific factors. The first step is determining whether it is possible to have a zip line where you want it. Most people can tell intuitively whether they have a good site for a basic zip line in their back yards. In those cases, we may contract with you over the phone depending on the length and location and show up the first time ready to install the zipline. If you are in Southeastern PA, we will be able to install it quickly at a relatively low cost. However, most level 2 & 3 ziplines and canopy tours require a preliminary on site feasibility study by a professional to determine whether a zip line is even possible in the desired location. You should expect to pay $1,000-4,000 to have us visit sites in the continental USA for zip line studies. If that seems steep, then you will probably also be shocked by the final price tag of over $2,000 and sometimes a lot more. You may prefer to collect topographic maps, measurements, and/or pictures to send to us before the first visit - this does not usually eliminate the need for a feasibility study, but it can help us give you a better range of construction costs before you commit to the cost of the first visit. Whatever type of zipline you have in mind, please call or email us to get the conversation started. Want to build your own Zip Line? If you would like to buy a kit or materials for a zip line, we suggest you consider these Zip Line Kits which come with instructions and a support line. We do not provide any consulting, plans, or support for DIY zip lines. There are just too many variables to consider with zip lines, and the consequences of making a mistake could be severe or fatal. The few bucks we would make advising you are not worth the risk. If we charged enough to make it worth it, then we might as well install the zipline for you. If you want more information, check out "How to Build a Zip Line". It's not perfect and we are not responsible for their content or advice, but it's a place to start your search for free zip line building advice if that's what you're after. Good Luck and happy zip line building!